As soon as I closed Ultraviolet, I realized something: I had just read something that I normally wouldn't have liked, and yet for some inscrutable reason, I did. I can't explain why, except that maybe I loved the main character, Alison. There was a random genre hop, the plot got a little too easy to predict, the romance was kinda cheesy... But something about the entire story worked for me. I loved the subject matter that drove the story in Ultraviolet. Synesthesia is a natural occurrence, but I loved how there was a sci-fi element involved. (Although, the sci-fi was where the genre hop came in. We're all meandering along, la-la-lala-la and suddenly there's a portal to the other side of the universe. Did not see that one coming.) Also, I liked seeing how Alison's "gift" played out as dementia. There were a lot of small twists and turns and hidden paradoxes in the world of the mental institute she'd found herself in. I liked how it was edgy, but not creepy. I don't do creepy very well, but my interest was piqued by the world RJ Anderson created. Alison was a great main character. She was well defined and I enjoyed her narrative: slightly sarcastic, somewhat ragged. And I liked how RJ Anderson applied definition to each of her characters. Faraday shifted and evolved throughout the story. Sweet, unassuming, and intelligent, I found him a very likable character. And no matter how brief their appearance, each character had a uniqueness about them that made it easy for me as a reader to follow along with the story. 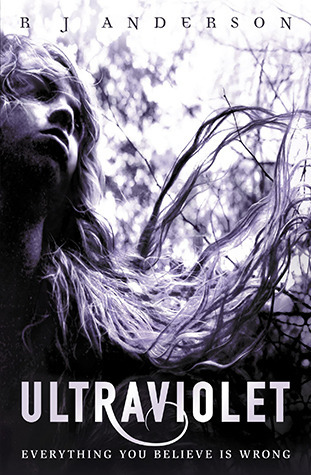 I really connected to Ultraviolet even though I could see things -- glaring scenes that would've had me scoffing and rolling my eyes had it been any other book -- things that should've bothered me, but didn't. The writing, for example, got a little too rushed in the second half of the book and the lack of description was appalling, but I still loved it. I was content from finishing a good book when I closed the cover. I'm so excited for the sequel, Quicksilver, and what new adventures will come next. Dark chocolate, poured over velvet: that was how his voice tasted. I wanted him to follow me around and narrate the rest of my life. I heard the universe as an oratorio sung by a master choir of stars, accompanied by the orchestra of the planets and the percussion of satellites and moons. The aria they performed was a song to break the heart, full of tragic dissonance and deferred hope, and yet somewhere beneath it all was a piercing refrain of glory, glory, glory. And I sensed that not only the grand movements of the cosmos, but everything that had happened in my life, was a part of that song. Even the hurts that seemed most senseless, the mistakes I would have done anything to erase--nothing could make those things good, but good could still come out of them all the same, and in the end the oratorio would be no less beautiful for it.